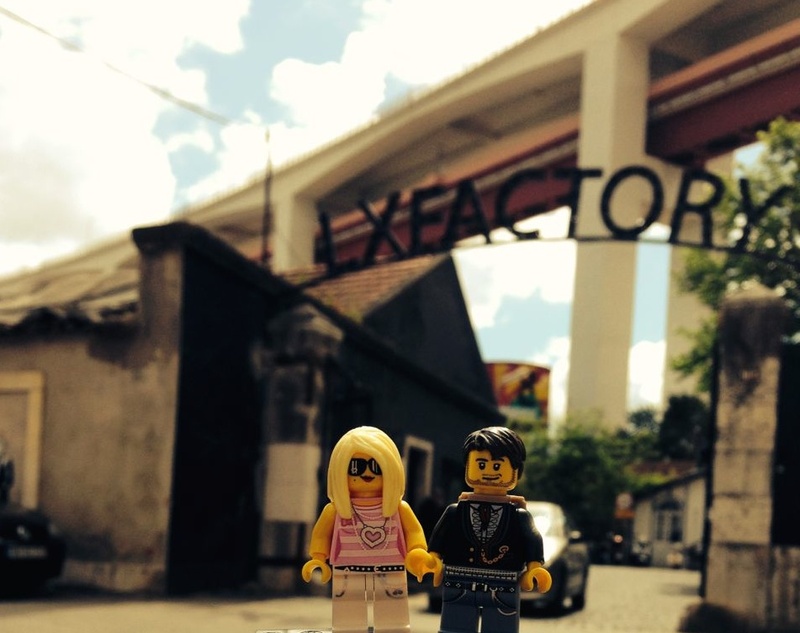 Home » Blog » Why Haven’t I Covered Shopping in Lisbon? From time to time I analyze the statistics for this site, including the most popular posts and the search terms people use to get here. It’s a lot harder to do the latter these days because Google usually hides search terms, but I do know that people sometimes come to my blog looking for advice on where to shop in Lisbon. So far, I haven’t helped them much. I’ve been to Lisbon four times already — two weeks in 2009, four months in 2012, and one month each in 2014 and 2015. All four times, I’ve returned to the United States with suitcases both heavier and emptier. How does one gain weight and lose bulk on a trip? The answer is books and CDs. Living in one of the most expensive cities in the world, I have neither the money nor the space for shopping sprees. Even with the euro at $1.13, down from about $1.35, clothing and other typical tourist purchases aren’t especially cheap. Besides, I’m the person who celebrates Buy Nothing Day on Black Friday. But I know I’m in the minority, and not shopping in Lisbon doesn’t mean I don’t know where the cool places are to shop. Back in 2009, there weren’t a lot of cool places. Lisbon was just beginning to attract a wider range of tourists, and the principal shopping districts were in the Baixa area between Rossio Square and the river and further north through Chiado and along Avenida da Liberdade. The Baixa area featured the typical tourist stores selling cork products, tiles, and other souvenirs and port wine. In Chiado, next to Rossio Square, the Armazens do Chiado mall attracted both tourists and mallrat teenagers. Liberdade was the site of upscale shopping, with the usual array of European designers from Gucci and Armani to Zadig & Voltaire. 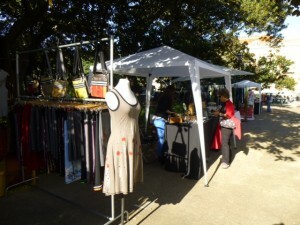 The Farmers’ Market at Principe Real in 2012. When we returned in 2012, it was at the height of the eurozone economic crisis. 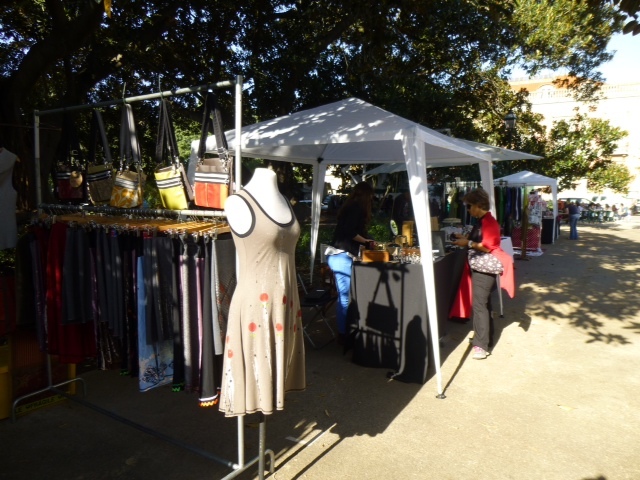 Small entrepreneurs could not afford to open boutiques, so some of them sold their wares at the Farmers’ Market at Principe Real and elsewhere. The following years, though, have seen a lot of activity in that area, including the restoration of old mansions that have been converted into spaces for pop-up stores and designers. The market sellers have moved indoors, and by spring 2015, the Principe Real area has revived into a neighborhood of designer clothing and gift stores, cafes, and restaurants. When we visited the neighborhood in May, all of the existing spaces were full, and we noticed several more buildings within four blocks of the plaza in the process of restoration. Opening around 2012, the LX Factory was the original hip destination for shopping in Lisbon. In fact, there is very little shopping there (mostly restaurants and clubs) — though I do recommend a visit to a very cute children’s furniture store and a couple of interesting boutiques with casual clothing and/or clothing inspired by South Asian fashion. 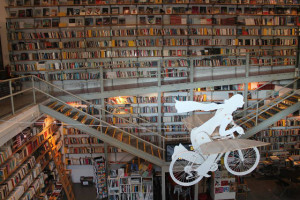 But my favorite indie bookstore in Lisbon, Ler Devagar, is located in the LX Factory and is alone worth the trip to this district of repurposed factories and warehouses located under the 25th of April Bridge. The interior of Ler Devagar retains the factory feel of the original building. Ler Devagar is what every bookstore should be — a community center where people gather for coffee and conversation and a place where local artists and writers can display their work and meet their audiences. For the visitor who doesn’t speak Portuguese, the store offers a selection of books in English, French, and other languages. 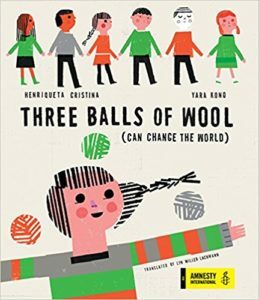 Last year I browsed the shelves of children’s books and brought home a picture book by Portuguese Nobel laureate José Saramago and one by Isabel Minhós Martins, whose O Mundo Num Segundo I was already translating for Enchanted Lion Books. Isabel’s book that I bought from Ler Devagar last year, Uma Onda Pequenina, is now slated to come out from Enchanted Lion next year under the title Tiny Wave. Because I was quite busy researching my novel-in-progress last month, I didn’t have a lot of time for shopping. All of my purchases were related to either my work as a translator or my novel research. 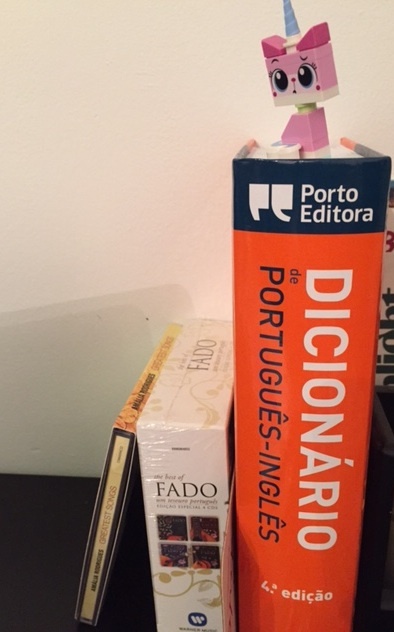 I bought a book and a CD at the Museu do Fado in Alfama, and another CD set, my big Portuguese-English dictionary, and several young adult books I’m reading for possible translation came from the FNAC store in the Armazens do Chiado mall. That mall, which has been around since the 1980s, attracts both locals and tourists but fell on hard times post-2009 and, while things seem to be improving in the past year, has never fully recovered. An art exhibit when I was there in May included a history of the mall and the downtown Chiado neighborhood. 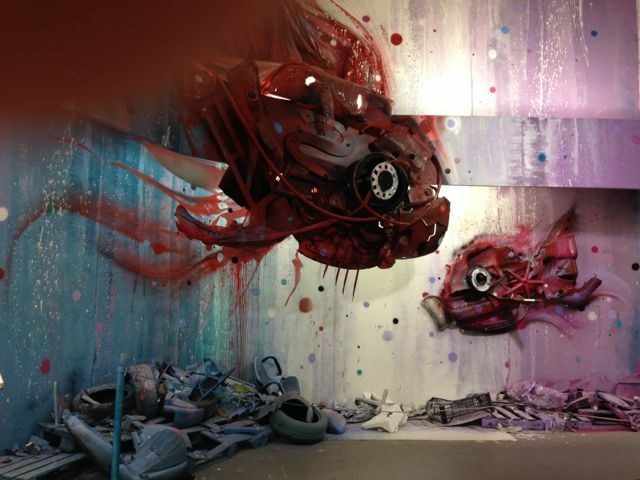 “Dirty Aquarium” by Bordalo II, one of the pieces from the Armazens do Chiado art exhbit. If you have any questions about Lisbon shopping or would like to talk about your favorites, please do so in the comments. I may not be the most profitable customer, but I do enjoy seeing the shops and am glad that they are there. Love the look of Ler Devagar . . . I could browse those stacks with a smile! I’m not much of a shopper either, but it’s fun to look when traveling. I’m a bit afraid of heights, so I would probably be careful on the upper level. And I used to be a big-time shopper while traveling, because being away from home takes away inhibitions about spending money. However, hubby and I recently moved to an apartment with about a third of the square footage of our old house, so if we buy anything, it means something else has to go out. Wow. Thanks for this shopping tour, Lyn. Will you be translating any other books soon? I love that Dirty Aquarium piece! That was my favorite piece of the exhibit, but they were all quite good. And I’m working on three books currently — two picture books that are slated to come out in the next year or so, and an older middle grade/young YA novel that’s under consideration by a publisher and for which I’ll be applying for a translation grant.